Amtrak provides daily service to Newport News from Boston, New York, Philadelphia, Baltimore, Washington, and Richmond. JLab is easy to reach by car. Coming in on Interstate 64, take exit 255A and follow Jefferson Avenue (Route 143 East) past Patrick Henry Mall and the Oyster Point Road intersection to Onnes Drive and take a left. Follow the signs to your intended JLab destination. Hampton Roads has several car rental agencies as well as new and used car dealerships. Make sure to check the Virginia DMV's website for rules and regulations concerning driving in Virginia. - turn left onto Lawrence Drive. This is the main entrance to Jefferson Lab. 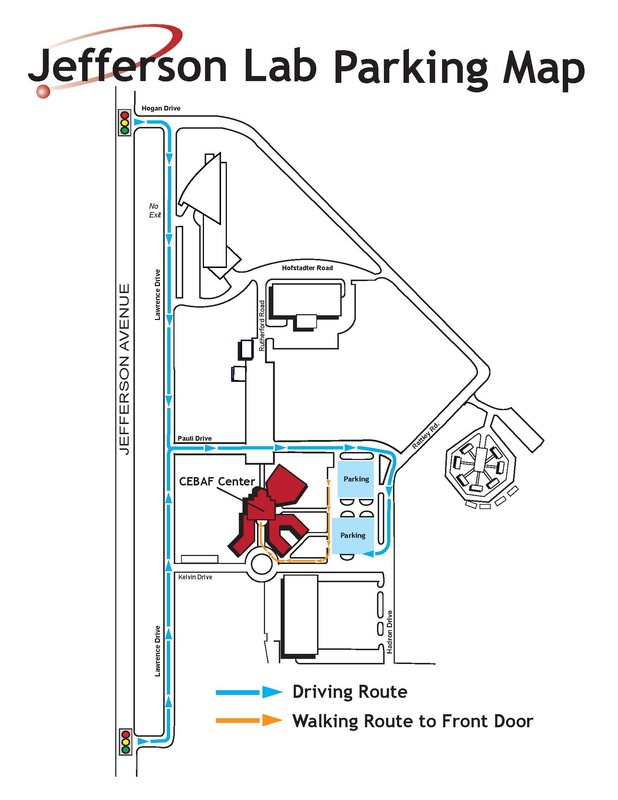 - go approximately one block and turn right onto Pauli Drive and continue to large parking lot on the right just beyond CEBAF Center. Click image below for a detailed map with directions.